A Southern California contractor profiled in an NBC 4 I-Team investigation could face the loss of his license and possible criminal charges. The Contractors State License Board confirms it has interviewed Lanny Dugar, owner of Finest Home Remodeling Inc. and his attorney and concluded that law(s) may have been broken in work left unfinished on the home of Jim and Kim Howard of La Verne. The Howards' contracted Dugar's company in the summer of 2014 to build a home addition for Kim Howard's ailing parents. The price of the contract was $172,250 and to date, the Howards have produced checks showing they've paid Dugar $135,000. The last check written to Dugar, was on Oct. 9, 2014; on Oct. 11, Jim Howard says he received a text message from Dugar that read, "off job," and continued to say Dugar's attorney would be contacting the Howards. Asked why he thought Dugar had walked off the job when there is still lots of work to be finished, Howard tells NBC 4's I-Team, "that's a great question, I wish I could answer that." The Howards say they did question some of Dugar's spending, asking for an itemized budget and payment schedule when items they'd paid for, such as windows and a patio, never materialized. They also filed a complaint with the CSLB after work stopped at their home. An investigator who inspected the unfinished addition concluded in his report that the work done thus far, "does not meet accepted trade standards for goods and workmanlike construction." 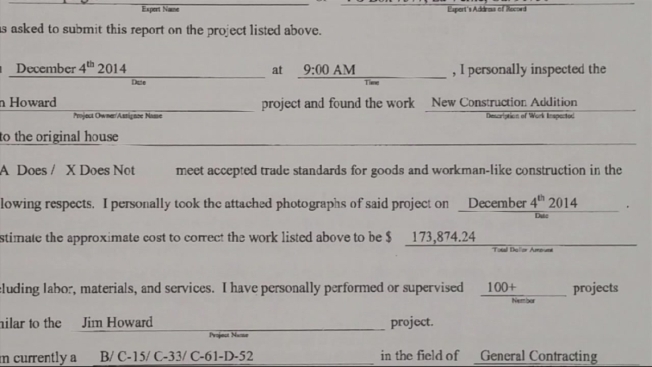 The investigator estimated that the cost to correct the work at $173,874, which is more than the original contract. Dugar and his attorney were asked to address the report's findings before the CSLB and the agency tells the NBC 4 I-Team, that after interviewing Dugar they do believe there are three probable violations that could carry administrative or criminal penalties. Departure from trade standards, plans or specs. CSLB officials say they will be forwarding the alleged violations to California Attorney General Kamala Harris' office for administrative review. In California, the Attorney General's office handles administrative penalties and could suspend or revoke Dugar's contractor's license. If it's determined that the charges warrant criminal charges, the case would be forwarded to the Los Angeles County District Attorney's Office for prosecution. Dugar's attorney did not return a message seeking comment. Dugar's attorney has insisted that his client had not walked off the job. He was "locked out" of the job by the Howards in a money dispute, the attorney previously told NBC4. Dugar's attorney also maintained that his client dealt with the Howards appropriately but would not comment further because of the ongoing investigation. Jim Howard says he will continue to push for a criminal charge in this case, believing that if prosecution leads to a conviction that will end any chance of someone else suffering as his family has, "unless this becomes a criminal matter I don't think the company (Dugar's) Finest Home's (Remodeling) cares," said Howard. If you have a tip on this story — or anything else — the I-Team wants to hear from you. Give us a call at 818-520-TIPS or email nbc4iteam@nbcuni.